KATE SEELYE (correspondent): In a church in the Iraqi village of Qaraqosh, a priest prepares for a communal baptism. With a splash of water, he welcomes these infants into the Christian faith. It’s a challenging time for Iraq’s Christians. Since the 2003 American invasion, the Christian community has been threatened and persecuted. Everyone is a target, including Father Mazen Ishou Mitoka. His church in the city of Mosul has been bombed three times. He himself was kidnapped and held for nine days. But the real horror took place last February when his parents responded to a knock at their Mosul home. FATHER MAZEN ISHOU MITOKA: My father opened the door and saw three armed people. They entered the house and my brother tried to resist them but he had no weapons. We don’t keep weapons at home. SEELYE: The intruders asked for an identity card to confirm that the family was Christian. They then shot and killed the priest’s father and two brothers. 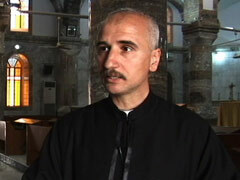 Father Mazin says the killings make no sense to him. MITOKA: Are they political or sectarian? Is this part of some plan to get rid of the Christians? There is always a question mark. Nobody claims the assassinations. SEELYE: Iraq’s Christians are one of the world’s oldest Christian communities. Most belong to the Chaldean Catholic Church. Others are Assyrian, affiliated with the Church of the East, or Syriac Orthodox. While they all speak Arabic, their native tongue is Aramaic, the language of Christ. 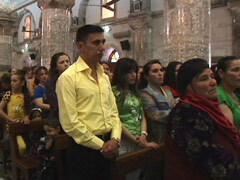 At the time of Saddam’s overthrow, there were estimated to be up to one million Christians in Iraq. Today their numbers have diminished by more than a third as Christians have fled a wave of violence, unleashed by the US invasion. Siham and Linda Basheer are widows. Their husbands, a father and son, were killed in 2008. The men were shot within two weeks of each other in Mosul by unidentified gunmen. The widows blame the violence on growing Muslim extremism and intolerance, which they say didn’t exist before the US invasion. LINDA BASHEER: During the Muslim holy month of Ramadan we sent food and well wishes to the Muslims. Muslims visited Christians, Christians visited Muslims. We all got along. But after the collapse of Saddam, everything changed. SEELYE: In the past, they say, Iraq’s Christians were an accepted and integral part of Iraqi society. Their contributions were significant, adds Basile Georges Casmoussa, the Syriac Archbishop of Mosul. BASILE GEORGES CASMOUSSA: In the 1950s, the dozens of doctors in Mosul were all Christian. 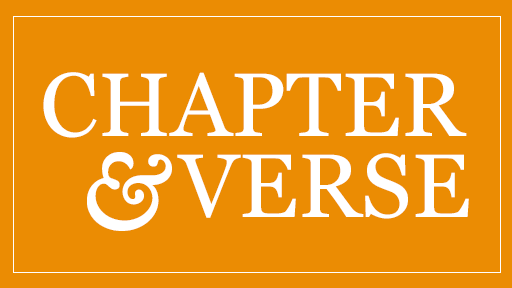 Christians opened the first schools, the first publishing house, the first theater, the first hospital. SEELYE: Most importantly, he adds, Christians were secure and protected under Saddam Hussein’s government, but the arrival of American troops put the community in a difficult position, adds Casmoussa. CASMOUSSA: The Christians suffered from the advent of the Americans because our Muslim brothers assumed that because they were Christians and we were Christians, we must be allies. So we had to defend ourselves against that. SEELYE: Christians were not a part of the Iraqi opposition to Saddam, unlike most Kurds and Shia Muslims. But once he was overthrown, many Christians took jobs with the American army. As law and order dissolved in the new Iraq, extremists filled the void. They accused Christians of being traitors, attacking their churches and businesses, and demanded that they convert to Islam. Without a militia to protect them, Iraq’s Christian community started to flee. Some came here, to this largely Christian village of Qaraqosh, where security is tight. Qaraqosh is located in the Nineveh Plains, just north of Mosul in the northern part of Iraq. Because it’s so secure, Qaraqosh has largely been spared the violence plaguing big cities like Mosul and Baghdad. Since 2005, nearly ten thousand Christians have fled here. This hastily erected compound houses hundreds of refugees, like the Basheers, who say they are just scraping by. BASHEER: The government has never given us anything but there are a few humanitarian organizations which sometimes give us food, clothes and money. SEELYE: But the vast majority of Christians refugees have fled Iraq altogether and are living in neighboring countries like Jordan and Syria. Christian leaders here are now debating how to keep the remaining members of their community from leaving. Some hope a new election law giving Christians a minimum of five seats in Iraq’s parliament will increase their influence. Other leaders have been talking about establishing a so-called “safe zone” for Christians in the Nineveh Plains. But Lois Marcos, a local council member in Qaraqosh, says it’s a bad idea. LOIS MARCOS: An autonomous zone would be a risky solution for the Christians because many other groups oppose it and if the Christians bring this issue up again there will be more threats and killings and migrations. SEELYE: Instead, Marcos says, he would welcome U.S and foreign aid to create jobs here, as well as to establish local police units, manned by Christians. 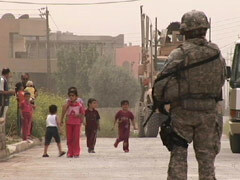 He says better local security is critical, especially given a growing dispute in the Nineveh Plains between Arabs and Kurds, a separate ethnic group. Marcos says the Kurds, who run a semi-autonomous region to the north, lay claim to parts of Nineveh, even though its under the jurisdiction of Iraq’s central government. MARCOS: We live in an area that is disputed. We have our brothers the Kurds to the north, and to the south, our brothers the Arabs. In Nineveh, we are stuck in the middle, caught between a rock and a hard place. SEELYE: Mayor Bassem Bello is from another Christian village in the Nineveh Plains. He says the American army has served as a buffer between feuding Arab and Kurdish forces, but now, he fears, Christians will suffer even more after US forces start to leave Iraq at the end of the summer. BASSEM BELLO: There is an Arab-Kurd conflict that exists in Iraq, nobody admits it. We minorities will be the victims of this conflict and this area will be a war zone. SEELYE: Lawyer Hani Andrews says given all the pressures his community faces, Christians see no future for themselves in Iraq. HANI ANDREWS: Every Assyrian Christian single man or woman wants to leave the country, if they get this chance, yes in general. If now, for example, if the United States administration declares that we are ready to give visas, U.S. visas to go to the United States for Christians in Iraq, I think at least 80 percent of what we have left of our population will leave the country to the United States. SEELYE: And what will that mean for the Christian community? ANDREWS: We are persecuted. We are, we have been killed every day. SEELYE: But what will that mean for the numbers of Christians in Iraq? Will there be any Christians left? ANDERWS: No, of course. The population is rapidly decreasing. Most of them want to flee. SEELYE: Hani adds that the disappearance of Iraq’s Christians would not be unprecedented. He points to neighboring Turkey, where a once flourishing Christian community is now virtually nonexistent. He says Christians in places like Egypt and Palestine are also leaving due to political pressures. ANDREWS: If these superpowers will stay ignoring what happening in the Middle East, I think maybe in the next 50 or 70 years the Middle East will be empty from Christianity. SEELYE: For Iraq’s Christian community, which traces its roots as far back as ancient Mesopotamia, it’s a bitter prospect. But the only real guarantee for its safety is a secure, stable, and democratic Iraq. With Baghdad’s politicians still fighting over forming a new government and American troops soon scheduled to leave, a stable Iraq seems to many Christians like a dream. For Religion & Ethics Newsweekly, I’m Kate Seelye in Iraq.